Healthy, Fit, and Focused: FIXATE - 21 Day Fix Cookbook and GIVEAWAY!! 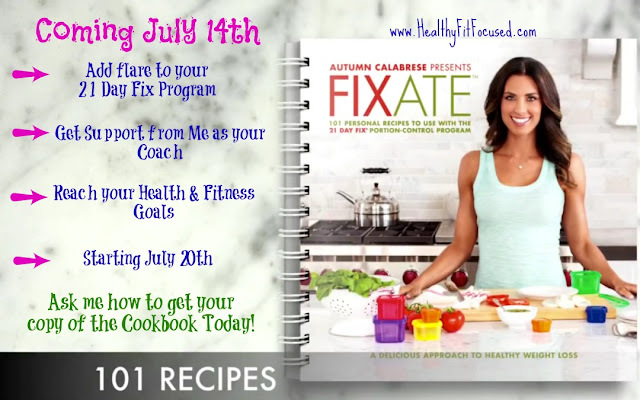 Well, I know you all are ALWAYS looking for more 21 Day Fix approved recipes...well...I've got some GREAT NEWS!!! 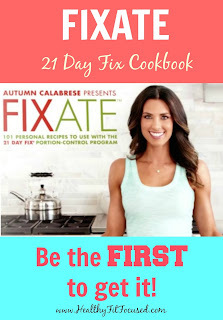 Coming soon ( like in 5 short days) the 21 Day Fix recipe book, FIXATE will be released!! I'm so excited for this! I love cookbooks and I'm super excited for this to come out. There's nothing better than a delicious and HEALTHY recipe book! Do you have any SPECIALS for the Fixate? - YES...read below! So, it's always fun to have a giveaway, right?? Well...I'd love to give away some FREE COOKBOOKS!!! Who's in? If you purchase a 21 Day Fix or 21 Day Fix Extreme Challenge Packs this month, you will be entered to win 1 of 5 FIXATE cookbooks which feature 101 recipes from 21 Day Fix Creator Autumn Calabrese to spice up your nutrition and keep you on the right path to success! If you're ready to start your health and fitness journey and take that leap of faith then I'm inviting you to join my Jiggle Free July challenge support and accountability group starting on July 20th. There is no better time than now! heart emoticon Lets do this!